Campus: 601 Huangpu W Ave, TianHe GongYuan, Tianhe, Guangzhou, Guangdong, P R China, 510630. Jinan University, is located in the Shipai district of Guangzhou. The total area of the university measures 730,000 sq.mt. Formerly known as Jinan Academy it was founded in 1906 in Nanjing during the Qing dynasty. Having a long history the Jinan Academy, then later renamed as Jinan School was transferred to Shanghai and Fujian before being finally reconstituted in Guangzhou in 1958. The College is under the Central Government of the Peoples Republic of China and owing to state support as well as the munificence of it’s benefactors both at home and overseas, from Hongkong, Macao and Taiwan, Jinan University has achieved success in various fields – teaching as well as scientific research. 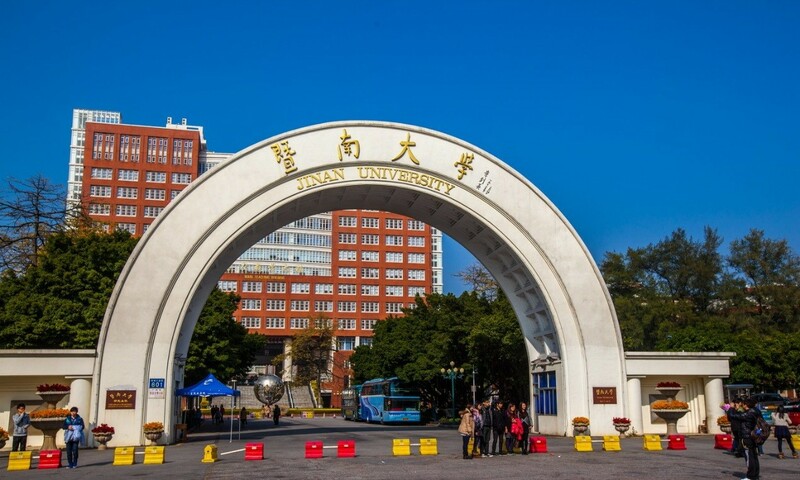 Jinan University is a comprehensive, multi disciplinary university with a College of Liberal arts, College of Science & Engineering, College of Economics and of course the Medical College. In March 1984 the college was registered with the World Health Organisation and the students have the privelege of taking and the clinical doctor and practioner registration which has raised the status and the reputation of the college. In April 1994, the affiliated hospital was designated as a 3rd-degree hospital (the top degree hospital designation in China) and in September 1995 it was appraised by medical authorities of Guangzhou, Guangdong province and China’s leading health organization. Leading health organizations at all levels have agreed that this affiliated hospital complies with WHO and UNICEF health standards; as a result, an infant-care hospital has been set up. The year 2005 ushers in an age of unprecedented cooperation between the college and India as the college opens it’s doors to India. The 1st Alumni association of MBBS students was held on June 14th 2015 Click here for details. The mutual cooperation and exchange of ideas as well as the exposure that these students will develop to the Chinese way of life will not only lead to better relations but will also lead to the dissemination of medical information & practices. The college is under the provincial government of Guangdong and is listed with the World Health Organisation and International Medical Education Directory (IMED). It is also enlisted with the Medical Council of India. Spacious and comfortable dormitories provided on a Twin Sharing basis, A/C, TV, Telephone, Internet & Attached Bath etc. Shops are located inside the campus making it very convenient for students. Nutritious and hygienically prepared food available in the college. Professionally run Indian Kitchen prepares excellent food at moderate prices. All vegetables available in India are also available in China. Guangzhou a city located in the south eastern part of China has pleasant moderate climate which resembles with most of the cities in India. Located in the Shipai district of Guangzhou. The Medical College of Jinan University was set up in 1978 alongwith a modern hospital known as Guangzhou Chinese Overseas Hospital. The college has set up 12 labs along with RMB 8.5 million in medical equipment. Besides the affiliated hospital, the college has a number of fieldwork units as teaching hospitals: Shenzheng People’s Hospital, Zhuhai Hospital, Macao Lake Hospital. Other fieldwork hospitals include Guangdong Province Hospital, Guangzhou Sixth Hospital, Zongshan Xiaolan Hospital, Heyuan City Hospital and Duanzhou Hospital (in Zhaoqin); there are eleven of these in all. The college’s teaching programs and curriculum strive to meet the needs of foreign medical practice, which are comparatively similar to the teaching programs of medical colleges in England and the United States. Simultaneously, they embody the requirements of China’s college education, which stresses students’ comprehensive improvement. Either of the teaching programs provide more than 5,500 major hours in order to comply with international standards. Currently the college has over 100 post graduate students among whom 15 are PhD and 88 master degree candidates There are 598 undergraduate students enrolled. Since 1988, a 3-year program professional training class has also enrolled students; there are 142 in this class. The nursing school offers a 3-year training program and has 189 students. The college library contains numerous books & periodicals with 53,000 periodicals and 430 magazines. There have been 2,117 scientific theses published and 118 of them have been published in the international medical issues; 476 have been assigned as international conference theses; 127 medical textbooks have been compiled by the school’s teachers and research fellows. The college has active good relations with many universities and colleges abroad among them Medical College of Science and Engineering of Texas, USA; Medical College of Alberta University, Canada; and the Seattle Washington Medical College, USA.